Also, another Lol/Selkie cross over Sketch Day will be this Saturday. Stay tuned! Listening to a live version of the Decemberist's Mariner's Revenge Song as I worked on the last few pieces of this strip. I think it's kismet. The only problem is that Heather will probably think it’s cool that Selkie can kick the ball so hard and with such precision. Well, one can only hope this gives Heather a chance to explain why she did what she did. Also that she can actually apologize to Selkie. I’m sure Selkie will understand once Heather explains how Amanda treated her after being adopted (Which should be a happy prospect.) and how she felt like she needed to redeem herself in the eyes of her friends. She was desperate for their approval and though she was wrong and misguided, I believe Selkie will understand once she explains to Heather that Amanda isn’t the type of person you want to seek approval from. Or Heather just appreciates having someone who can kick the ball hard enough to truly be given a challenge in goal tending . I meant this would hopefully, eventually lead to Selkie lashing out over the events that happened to her and Heather would be able to explain her actions. Not that just the ball being kicked at Heather would somehow make Heather explain herself. As I understand it Selkie was told why Heather did it – by Kiesha. As far as I remember, all Keisha said was that she wasn’t Heather’s friend anymore because she was adopted and Selkie called her stupid and a bad friend. Selkie probably doesn’t fully understand what took place. She needs to hear it from Heather. Everyone saw how horrified Heather was about being ‘sent back’ and Selkie would surely understand if Heather explains why she did what she did. Besides, Selkie has been bullied before, she’ll probably begrudgingly sympathize with Heather because she also ended up being bullied by Amanda. Although Selkie will probably remind her that bullying doesn’t feel good and further bullying another child to get rid of your own bullying doesn’t help. Children who bully often go along with the main antagonist or antagonistic group so they themselves won’t end up bullied. Is it right? No. Is it the child’s fault that they’re afraid of being bullied themselves and see no other real option? No. Especially when teacher’s tend to turn a blind eye to serious cases of harassment. Harmless teasing is one thing and kids need to learn to grow a little backbone and not be so damned sensitive about basically nothing, but serious cases of torment need not be taken lightly. Sometimes the kids are just too afraid to talk about it though. As someone who was bullied in school, I’m pretty sure that Selkie won’t give two craps for why Heather bullied her, and the pathetic excuse of “I only did it so she wouldn’t pick on *me*” won’t carry any weight at all. Shades of the Waterboy there selkie. ………..ok hun you don’t have to kill her….. I was picturing Shaolin Soccer, except there were no flames as the ball fought the friction of the air. Was Heather always stocking footed, or did Selkie just knock her out of her shoes? If so, Wa-POW indeed! DANM IT! I was going to say that! Oooh, Heather had that coming. Hope this leads to a genuine apology (once her overwhelmed solar plexus gives her breathing reflex back). Not sure if Selkie will buy the explanation of being ostracized by the others (which is not a good excuse in the first place), though having an ally at school might appeal to her. Not a friend though, not right away. 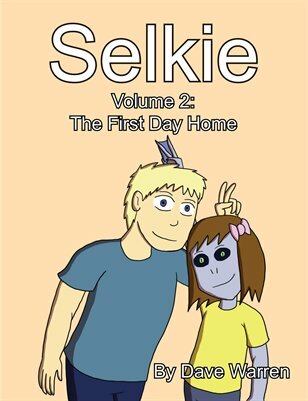 Some kids can be quick to forgive… but I gotta say that Selkie doesn’t strike me as that type. Perhaps this will knock the air out of Heather; then while her diaphragm resets, she can also experience suffocation and possibly understand Selkie even more. How strong are her toes/the front part of her foot? I’d think they wouldn’t be very strong (wouldn’t need to be very strong) on water people, which could make kicking like that painful. Selkie is kicking with the ball of her foot, so her toes are fine. On a related note, has anybody here seen Waterboy with Adam Sandler? Because Heather is totally Selkie’s Colonel Sanders.